Community Foundation Grey Bruce emerged out of a vision held by a few community-minded individuals who were involved in the non-profit sector. The present Community Foundation Grey Bruce got its start in 1992 after the then-Mayor of Owen Sound, Ovid Jackson, attended a conference in Ottawa where he learned about the benefits realized by communities that had their own Community Foundation. Upon his return to Owen Sound, Mayor Jackson and City Manager Lyle Love started the action to set up a steering committee to look into the possibility of a Community Foundation in Owen Sound. The committee was made up of a group of community-minded citizens who envisioned an organization that would provide services to local residents through non-profit groups and volunteer organizations. After a series of “kitchen table” meetings and a feasibility study, the groundwork was laid to establish a local Community Foundation. The Owen Sound and Area Community Foundation was incorporated in 1994 and, in its first year, donors contributed $12,000 in endowment funds. The first pledge was from Eva Leflar for $50,000 over 5 years. In 1995, Percy and Kathleen Noble donated $50,000, resulting in the Foundation’s first named endowment fund. Ernestine McKenna began at $1/year as Executive Director to start the Foundation and in December 1995 grants totalling $2,500 were presented. By December 31st, assets including cash and pledges reached $300,000. The assets of the Owen Sound and Area Community Foundation grew steadily over the following years and, by December 2000, had reached $1,000,000 in endowed assets. $33,675 were awarded in grants that year. By 2001, the Board of Directors realized that the scope of the Foundation reached far beyond Owen Sound and Area and began the process to include all of Grey and Bruce Counties. The name changed to Community Foundation Grey Bruce in March 2003. In 2008, a significant donation was made to the Foundation by founding donor Eva Leflar to start the Eve Leflar Donor Advised Endowment Fund, driving the assets to $3,679,526. Miss Leflar was the first to pledge to the Foundation in its infancy and she saw how her donations could benefit organizations in the Future, especially those aiding underprivileged children. She continued to be a Foundation supporter until her death in December 2012 and afterwards left a bequest to her endowed fund as well. Betty MacKay of Owen Sound had her lawyer draw up her will with provision to support charities in her community through Community Foundation Grey Bruce. After her passing in December 2007, the Betty Isobel MacKay Memorial Fund was established and has helped 65 funds to grow by way of a Dollar Matching Program. In 2011, Community Foundation disbursed $113,521 in grants across Grey and Bruce Counties from endowed funds held by the Foundation. These funds included Donor Designated funds where the donor names the charity specifically to receive the grant, Donor Advised funds where the fund holder advises a field of interest to which he/she wants to support in granting, Unrestricted funds where the donor lets the Foundation grant to projects as determined in need in the year and Agency Funds which are set up by charitable organizations to support their own operations. Assets were $ 5,716,457 that year. As the result of a call to action by Governor General David Johnston, a Smart & Caring Communities Education fund silo was created in 2013 to provide a sector for endowed funds supporting scholarships, bursaries or awards to Grey Bruce students. By January 2018, there were 37 endowed funds supporting education. The year 2016 found Community Foundation Grey Bruce as the top source for grants to charities supporting people in communities across Grey and Bruce Counties. Year-end assets were $15,505,449 and $654,769 was disbursed in grants. In October, Community Foundation Grey Bruce presented its Vital Signs report measuring life in Grey and Bruce Counties on six topics: health & wellness, the environment, living standards, arts & culture, education and lifelong learning, and community connections. 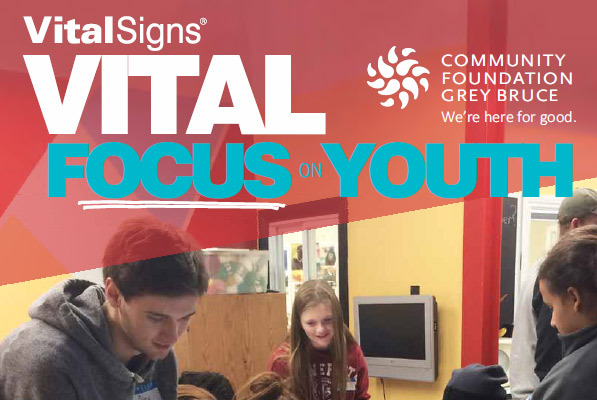 Vital Signs will help establish the Foundation’s granting needs as well as provide priorities for our community to consider in the coming years. Community Foundation Grey Bruce has kept pace with the needs and priorities of the two counties that it serves. The Foundation is always quick to support initiatives - the environment, through three Environmental Forums; scholarship information for local students, through a website payforschoolgreybruce.com; sportsmanship through the True Sport initiative. Since its inception, the Foundation has brought many informative speakers to the area including Lieutenant Governor of Ontario Hall Jackman, Canadian politician David Crombie, Canadian diplomat and philanthropist Stephen Lewis, Simon Jackson, founder of the Spirit Bear Youth Coalition; Owen Sound native and CBC ews anchor Heather Hiscox; former Prime Minister, the Right Honorable Paul Martin; and former Governor General of Canada, Right Honorable David Johnston.